In December 2012 we reported that scientists in Italy had founded Pro-Test Italia to counter the rising tide of ignorance and intimidation that threatens the future of science in Italy. Last weekend we heard about a new animal rights outrage in Italy. As reported in Nature News, activists broke into the Department of Pharmacology in the University of Milan on Saturday, where they wrecked valuable research projects before leaving with over a hundred mice, rats and rabbits. On previous occasions the response from the scientific community to such raids and theft in Italy has been lacklustre at best, but this time things would be different . Our colleagues in Pro-Test Italia take up the story. 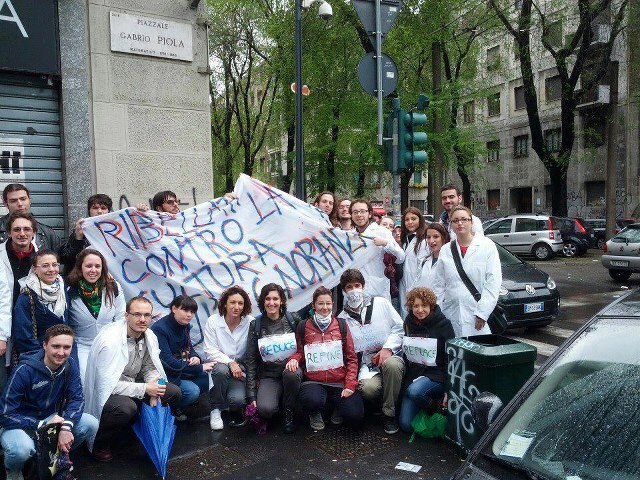 Scientists take to the streets of Milan! On Saturday the 20th of April, a national rally against “vivisection” took place in Milan, with about 200 people participating. Just before the rally’s beginning, 5 animal rights activists posted on the “Coordinamento Fermare Green Hill” (Coordination to stop Green Hill) Facebook page announcing that they had forced entry inside the Pharmacology Department of Milan’s University. Those activists barricaded themselves inside the animal facilities, tying chains both around their necks and around the doors’ handles to prevent police from breaking in. They demanded that every animal in the facilities should be released in their hands – about a thousand rats and seventeen rabbits; meanwhile they removed the animals’ tags, rendering them effectively useless and throwing away years of research about Parkinson’s, Multiple sclerosis, autism and such. In an effort to prevent injuries to the people involved, the director of the department started negotiations that ended with the release of the activists from the department. The activists got to take away with them about a hundred mice and rats and a rabbit, with the promise that even more animals released into their hands in the following days. Of course at that point the animals were already useless for research. Meanwhile, the “anti-vivisection” rally reached the building, and started throwing names at the researchers, calling them “Killers” and “Monsters”. Bice Chini, researcher at the CNR Institute of Neuroscience, explained during an interview with La Repubblica why the damage isn’t only monetary. This time the Italian scientific community raised its head. On Saturday afternoon our association, Pro-Test Italia, with help from the organization Federfauna – which supports the interests of people who work with animals – and the Facebook page “A Favore Della Sperimentazione Animale“, managed to get authority’s permission for a peaceful rally on Sunday morning in Milan. About 60 people, mostly students and young researchers, took part in the rally, wearing white coats and carrying banners in support of science and against bullying, ignorance and misinformation.. The first objective of the rally was information: participants were good mannered, never stooping down to insults, and explained to passers by why animal research is important and what makes this latest action by animal rights activists so despicable. A small group of said activists tried to disturb the peaceful rally, but with no success. Our friends from OMG! Science, took part in the rally with us: they interviewed passers by many of whom did understand the gravity of Saturday’s actions by animal rights activists. Our rally was reported both on a local (TG3 Regione) and national TV News (Tg1, La7 Cronache), and many leading Italian newspapers and press agencies also spoke of these events, including Corriere della Sera, La Repubblica, ANSA, La Stampa, Il Giornale and Il Giorno. What has also been striking over the past few days is the volume of messages of support that we have received, and the many new likes on our FaceBook page, all of which shows how many Italians were waiting for somebody to stand up to animal rights extremism. The biggest animal rights associations in Italy (such as LAV, ENPA, LeIDA) said nothing about Saturday’s activists crimes, and it’s not the first time they avoid condemning such acts. We can only wonder why. Sunday was something of a milestone: for the first time members of the Italian scientific community took action against animal rights activists’ violence and criminal behavior, and we took part in our very first rally. We look at these brave young scientists and students with trust and expectation, hoping that things will now really start to change. Update 13.55 BST, 23 April 2013- The Rector of the University of Milan has stated that there is no agreement between the University and the animal rights extremists, and that no more animals will be handed over to them by the depatement. This is welcome but not entirely surprising as to do so would violate animal welfare regulations – especially those governing the care of genetically modified animals. Addendum: Pro-Test Italia have informed us that they will be holding another rally in Milan on Saturday June 1st, you can find the details on FaceBook! Posted on April 23, 2013 May 3, 2013 by EditorPosted in Animal Rights News, Campus Activism, NewsTagged animal research, animal rights, extremism, Italy, nature, Pro-Test Italia. i understand their reason for pulling this huge stunt but they effectively wasted the lives of thousands of animals as all these animals will be replaced and the research started again. plus all those animals they took may very well die in the care of the hands of the activists that supposedly liberated them. Go Pro-Test Italia! While the events at Milan are incredibly saddening, it’s encouraging to see people willing to stand up and speak out for the importance of animal research.